If you ever think of DIY (do it yourself) projects, leave it to the politicians to convince you otherwise (although they may be right). As Tom Newton Dunn, Political Editor for the Sun recounts below, all of a sudden, finding a stylish storage solution that is not only affordable but delivered and set-up for you with the only task you are responsible for is placing your belongings and enjoy looks great. 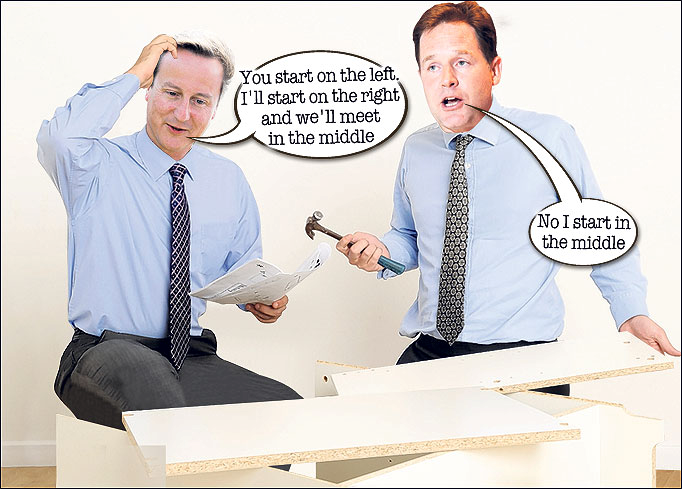 The pair, whose blossoming friendship once saw them dubbed “the Brokeback Coalition”, put together the flatpack furniture for Mr Cameron’s new daughter Florence. 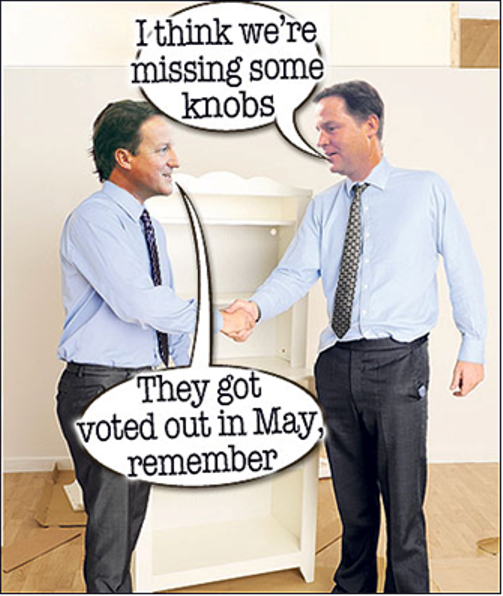 In an exclusive interview on the eve of the Lib Dem conference, Deputy PM Mr Clegg told how he helped out two weeks ago in the Camerons’ refurbished Downing Street flat. The father of three said: “David was still on paternity leave and I was holding the fort. “They were installing themselves in the flat upstairs and David said to come up and see little Florence – who is adorable. 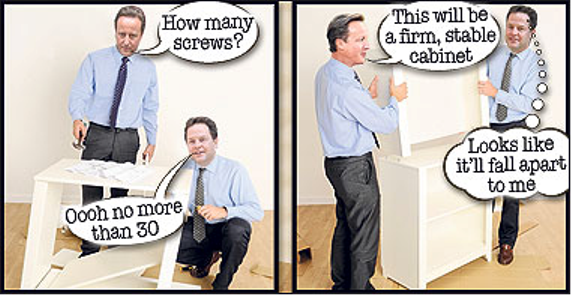 “So I went up, and found her asleep, but the Prime Minister struggling with an IKEA cupboard which he was assembling. “I felt I was able to provide some helpful tips, having struggled with IKEA cupboards myself before. The bonding session is an intriguing insight into how close the former poll rivals have now become. Their friendship prompted the jibe by rebel Tory MP David Davis about Brokeback Mountain, the Hollywood tale of two gay cowboys who fall in love. But Mr Clegg laughed that off, explaining: “I actually found it quite funny. He said the partners do often keep in touch from their different office buildings by text message. This entry was posted in Celebrities, Storage and tagged cabinet, diy, furniture, ikea, storage. Bookmark the permalink. Really great article with very interesting information. You might want to follow up to this topic. That’s going to make things a lot esaeir from here on out. I don’t even know how I ended up here, but I thought this post was good. I don’t know who you are but definitely you are going to be a famous blogger if you aren’t already Cheers! Good write-up. I am regular visitor of this website. Keep up the interesting articles and I will be back! Many thanks for this article and for your site on the whole. I’ve just subscribed to your news feed. I believe this web site has some real great information for everyone. “The expert at anything was once a beginner.” by Hayes. it seems as though you relied on the video to make your point. You obviously know what youre talking about, why just post videos to your weblog when you could be giving us something enlightening to read? Thanks for discussing your ideas. I have been exploring for a little bit for any high-quality articles or weblog posts in this sort of space . Exploring in Yahoo I eventually stumbled upon this website. Studying this info So i am satisfied to convey that I have a very excellent uncanny feeling I came upon just what I needed. No doubt will I make sure that I do not omit this web site and provides it a glance regularly. Hi my friend! I wish to say that this article is awesome, greatly written and filled with with almost all important infos. I would like to see more posts like this. very good submission. I actually love this web site, keep on it! I like your blog a lot, It is quite a nice berth to see and uncover details. Your blog is actually unique. Keep posting that way. Sup there administrator, I mainly desired to make a short observation to proclaim that in fact I preferred your particular posting. Thanks! Hello, its a great article along with this YouTube video; the video really enhances the article. Absolutely well composed content, thank you for posting. What a nice YouTube video! Remarkable, I loved it, and I am sharing this YouTube film with all my friends.